Daniel Saileupumoni Shelton (born August 20, 1993) is an American football defensive tackle who is a free agent. He was drafted by the Cleveland Browns in the first round of the 2015 NFL Draft. He played college football at Washington. As a true freshman in 2011, he played in 13 games with one start and had 11 tackles. As a sophomore and junior in 2012 and 2013 he started every game at nose tackle for the Huskies. He recorded 45 tackles and 0.5 sacks in 2012 and 59 tackles and two sacks in 2013. Shelton entered 2014 as a starter for the third straight year. He recorded four sacks against Eastern Washington, which was more than he had combined the previous three seasons and the most for a Huskies player since 1989, earning him first team AP All-America. He finished the season with nine sacks. Shelton was also a member of the Huskies' track and field team. On April 30, 2015, Shelton was drafted by the Cleveland Browns with the 12th overall selection of the first round in the 2015 NFL Draft. When meeting with Roger Goodell on stage, he hugged the commissioner and lifted him off the ground in excitement. Shelton was the University of Washington's first defensive lineman selected in the first round of a NFL draft since Steve Emtman in 1992. On May 12, 2015, Shelton signed a four-year deal worth $11.7 million. In 16 games of his rookie season, Shelton played 16 games with 36 tackles. After center Alex Mack left the team in free agency during the 2016 offseason, Shelton changed his jersey number from 71 to 55, which was previously worn by Mack. Shelton had wanted the number since being drafted by the Browns but opted for his college 71 since 55 was unavailable. He explained he wanted to adorn 55 as tributes to his brother Shennon and former NFL linebacker Junior Seau, both of whom have died and have worn 55 while playing football. In 2016, he started all 16 games with 59 tackles and 1.5 sacks. On February 23, 2017, Shelton underwent a minor wrist surgery. In 2017, Shelton started 14 games for the Browns recording 33 tackles. 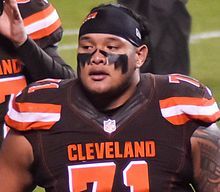 On March 10, 2018, the Browns agreed to trade Shelton and a 2018 fifth-round draft pick to the New England Patriots for a 2019 third-round pick. The deal became official on March 14, 2018, at the start of the NFL year. On May 2, 2018, the Patriots declined the fifth-year option on Shelton's contract, making him a free agent in 2019. Shelton helped the Patriots reach Super Bowl LIII and defeated the Los Angeles Rams 13-3. On May 1, 2011, Shelton and his brothers were involved in an altercation at an apartment complex in Auburn, Washington. ^ "Pac-12 football All-Conference team announced". Pac-12. ^ "Shelton Named First-Team Academic All-America". GoHuskies.com. Archived from the original on December 8, 2014. ^ "2014 AP All-America Team, List". College Football. ^ "Video: Danny Shelton is ready for Hawaii opener". The Seattle Times. ^ "Danny Shelton is finding the fun again". Auburn Reporter. ^ "Auburn High's Shelton commits to UW". The Olympian. Archived from the original on October 8, 2014. ^ "West Central District 4A Championships". WASplit. ^ Elaine Thompson (September 16, 2014). "UW's Danny Shelton getting big-time attention". The Columbian. ^ "Huskies". The Seattle Times. ^ Cabot, Mary. "Shelton selected by Browns 12th overall in first round of 2015 NFL Draft". cleveland.com. cleveland.com. Retrieved April 30, 2015. ^ Busbee, Jay. "Shelton gives Goodell a big hug after being drafted". Sports.Yahoo.com. Yahoo Sports. Retrieved May 1, 2015. ^ a b Gribble, Andrew. "Why Browns DL Danny Shelton changed his number to 55". ClevelandBrowns.com. Retrieved April 20, 2016. ^ Orr, Conor. "Danny Shelton has minor wrist surgery". NFL. Retrieved February 23, 2017. ^ Knoblauch, Austin (March 10, 2018). "Browns agree to trade Danny Shelton to Patriots". NFL.com. ^ Maks, Patrick (March 14, 2018). "Browns trade Danny Shelton to Patriots for 2019 3rd-round pick". ClevelandBrowns.com. ^ "Browns' pick Shelton overcame brother's death to make NFL". ESPN.com. Associated Press. May 1, 2015. Retrieved May 1, 2015. ^ Nate Ulrich. "2015 NFL Draft: Washington nose tackle Danny Shelton overcomes tragedy to become projected first-round pick who's drawn interest from Browns". www.ohio.com. ^ "Prosectors decline to press charges in shooting death, citing self-defense". AuburnReporter.com. Retrieved July 8, 2016.